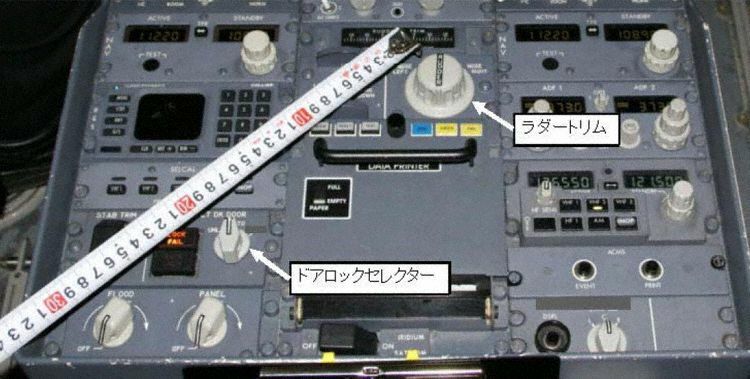 24 Nov 2014 - The FAA have issued a Special Airworthiness Information Bulletin about the inadvertent actuation of the flight deck controls following the Japanese 737 in-flight upset caused by the PF inadvertently operating the rudder trim instead of the flight deck door. On September 6, 2011, an upset event occurred on a The Boeing Company Model 737-700 airplane during cruise. The pilot inadvertently operated the rudder trim switch while intending to unlock the flight deck door. The autopilot initially countered the airplane roll, due to the rudder deflection, with an opposite wheel command. When the autopilot reached its authority limit, the airplane began to roll and pitched nose down, which resulted in a significant altitude loss and heading change before control of the airplane was recovered by the pilot. During the investigation of this incident, numerous aisle stand configurations were identified due to the multitude of supplemental type certificate installations and significant variability in the Boeing-delivered configurations. On the incident airplane (Model 737-700), the rudder trim switch is in approximately the same location as the flight deck door control switch on the operator’s Model 737-500 airplane. This creates a potential for confusion when pilots transition between aircraft. Positive training on one model can become negative when the pilot transfers to a different model. Although the rudder trim switch (Figure 1) and flight deck door control switch (Figure 2) are different in size and shape (cylindrical vs. blade shaped), and the flight deck door unlock side of the switch must be depressed before turning, the general feel (spring force) to actuate the switches is similar; both are spring loaded to the center position. In this incident, the negative transfer error allowed the pilot to think he had operated the correct control, and the similarity of the control’s operation exacerbated the situation. • The flight deck door control switch should not be used to unlock the flight deck door. • A cabin crew member must enter the flight deck when another flight crew member leaves. • The flight deck door must be monitored with the view port or camera and positive control of the door must be maintained until it is opened manually to allow re-entry of the flight crew member. Note: There are other advantages to having an additional crew member in the flight deck, e.g., in case of pilot incapacitation or illness. In response to this incident, Boeing analyzed modifying the shape of the flight deck door control switch; however, they determined the position of the switch is more important than the shape of the switch from a human factors perspective. Position of a switch that affects pilot reach/posture provides better feedback to the pilot than the shape of the switch that the pilot feels. Boeing determined the most important factor to minimize inadvertent activation of the control switches is aisle stand configuration consistency within an operator’s fleet. Therefore, Boeing developed new design guidelines for the aisle stand configuration for airplanes in production. The aisle stand is divided into three columns: left column (captain side), center column, and right column (first officer side). These guidelines minimize aisle stand configuration variations within an operator’s fleet and, when possible, move the flight deck door control switch to the far right column as far aft as possible and move the rudder trim switch to the center column as far aft as possible. Having a consistent position for the rudder trim switch is paramount because it provides a direct input to the aircraft rudder and can induce both yaw and roll into the aircraft flight attitude. Because both the rudder trim switch and the flight deck door control switch have a similar feel and action (turn and hold), a standard location and sufficient separation between these controls is recommended. Placing the controls in the recommended locations is consistent with most Boeing-delivered airplanes and creates a distinctive reach posture, provides sufficient separation in relation to reach direction from both seats, and provides adjacent tactile landmarks. This includes the railing in the corner of the aisle stand and the guarded stabilizer trim switch located between the rudder trim switch and the flight deck door control switch, which provides additional feedback to the pilot on which control is being touched. Boeing issued Service Letter 737-SL-27-238, “Inadvertent Activation of Rudder Trim,” dated September 19, 2012, to provide operators with additional information. 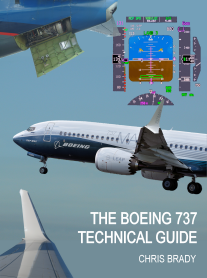 The Service Letter is associated with the 737 fleet; however, Boeing agrees the recommendations it provides are pertinent to all Boeing airplanes.